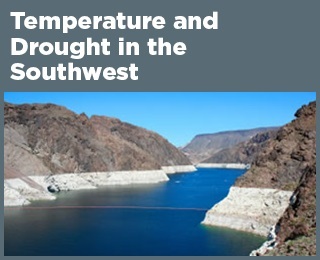 ﻿ Fun Easy English - Environment - Global warming - Climate change Indicators: Temperature and Drought in the Southwest. This feature provides a closer look at trends in temperature and drought in the southwestern United States. Every part of the Southwest experienced higher average temperatures between 2000 and 2015 than the long-term average (1895–2015). 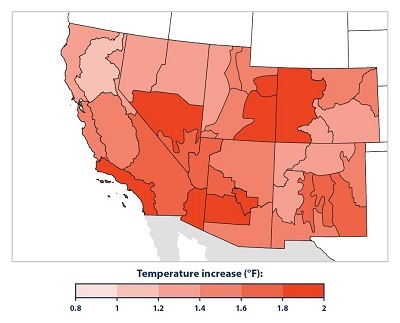 Some areas were nearly 2°F warmer than average (see Figure 1). Large portions of the Southwest have experienced drought conditions since weekly Drought Monitor records began in 2000. 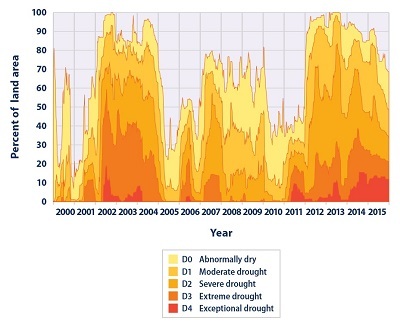 For extended periods from 2002 to 2005 and from 2012 through 2015, nearly the entire region was abnormally dry or even drier (see Figure 2). Based on the long-term Palmer Index, drought conditions in the Southwest have varied since 1895. 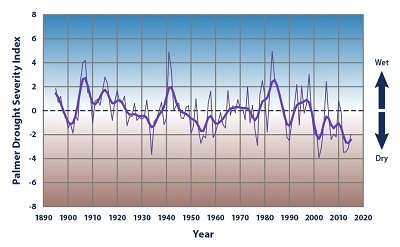 The early 1900s and the 1950s experienced considerable drought, the 1980s were relatively wet, and the last decade has seen the most persistent droughts on record (see Figure 3). Background was not available for this page. Natural variability, changes in irrigation practices, and other diversions of water for human use can influence certain drought-related measurements. Soil moisture, ground water, and streamflow are part of Drought Monitor calculations (Figure 2), and they are all sensitive to human activities. Data for Figures 1 and 3 were obtained from the National Oceanic and Atmospheric Administration’s National Centers for Environmental Information, which maintains a large collection of climate data online at: www.ncei.noaa.gov. Data for Figure 2 were provided by the National Drought Mitigation Center, which gives historical data in table form at: http://droughtmonitor.unl.edu/MapsAndData.aspx. This map shows how the average air temperature from 2000 to 2015 has differed from the long-term average (1895–2015). To provide more detailed information, each state has been divided into climate divisions, which are zones that share similar climate features. This chart shows the percentage of land area in six southwestern states (Arizona, California, Colorado, Nevada, New Mexico, and Utah) classified under drought conditions from 2000 through 2015. This figure uses the U.S. Drought Monitor classification system, which is described in the table in the Drought indicator. This chart shows annual values of the Palmer Drought Severity Index, averaged over six states in the Southwest (Arizona, California, Colorado, Nevada, New Mexico, and Utah). Positive values represent wetter-than-average conditions, while negative values represent drier-than-average conditions. A value between -2 and -3 indicates moderate drought, -3 to -4 is severe drought, and -4 or below indicates extreme drought. The thicker line is a nine-year weighted average.